Mexico commemorates Benito Juárez with a federal holiday on or near his birthday of March 21 (his birthday). A Zapotec, Juárez is the only full-blooded Indigenous leader to serve as President of Mexico. His name is used frequently throughout the country, from the state university Universidad Autónoma Benito Juárez to Mexico City’s International Airport. 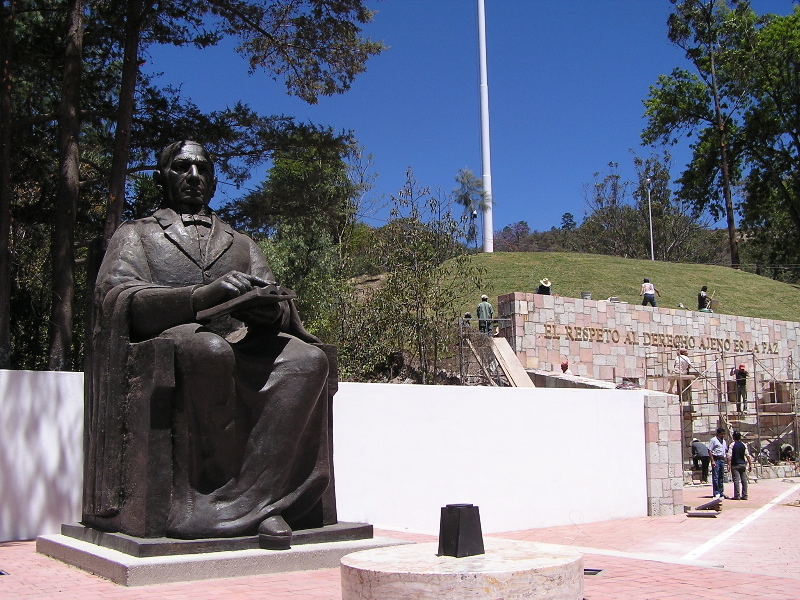 Other towns named after the leader include Benito Juárez and Ixtlán de Juárez. So who is this illustrious leader? Benito Pablo Juárez García (March 21, 1806 – July 18, 1872) served two terms (1861-1863 and 1867-1872) as Mexico’s President and is regarded as one of Mexico’s most beloved leaders. Born in 1806 in the village of Guelatao, Juárez was orphaned at age three. When he was 12, he moved to Oaxaca City for education. He led the nation in a struggle against neocolonialism and French intervention and earned the title of ‘Benemérito de las Américas,’ or deserving of the Americas’ praise. His most-cited quote is ‘El respeto al derecho ajeno es la paz‘ (Respect for the rights of others is peace). There are frequent comparisons between Juárez and U.S. President Lincoln. Lincoln lived between 1809-1865 and Juárez between 1806-1872. English – Respect for the rights of others is peace. Deutsch – Die Achtung der Rechte anderer ist der Frieden. Francais – Respecter les droits d’autrui est la paix.